A bridge between hiking and technical mountaineering, alpine scrambling leaves most of the technical climbing tools aside while navigating off-trail to a summit. Scrambling takes the adventurous, high, off-the-beaten path to summits in the Cascades and Olympics - sometimes on moderately steep rock and snowfields. A course with mutiple workshops and field trips designed to prepare you for conquering summits and traveling safely in the backcountry. 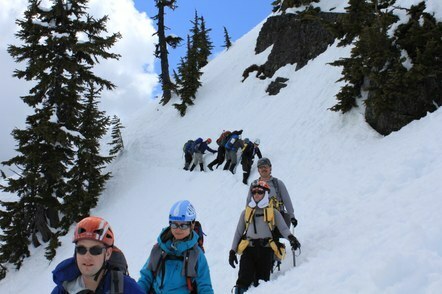 Instruction covers proper equipment and clothing, route-finding, avalanche awareness and avoidance, rock and snow travel, ice-ax arrest, glissade techniques and wilderness ethics. The course has a series of lectures and corresponding field trips throughout the spring to prepare students for completing three summits during the summer. Wilderness First Aid and Basic Navigation are co-requisites for completion of the course. The course generally opens for registration in mid-fall and begins in February or March. It is offered by Everett, Kitsap, Olympia, Seattle and Tacoma branches. Additionally the Seattle branch offers a compressed version of the course typically in April or May which combines the field trips and lectures into a three-day weekend plus an experience field trip in addition to the required summits. Please note since this is a shortened duration there is an expectation of having a higher fitness level initially rather than the regular course listing which is designed to help you build fitness as you go.